A beautiful approach to composition and posing for Videos and Stills. These are exciting times for marriage equality—but capturing memorable LGBTQ footage for wedding videography requires a novel approach to posing, which until now has been nearly exclusively oriented toward pairing a taller man in black with a smaller woman in white. What works for Jack and Jill won’t necessarily work for Jack and Michael, let alone Jill and Louise. 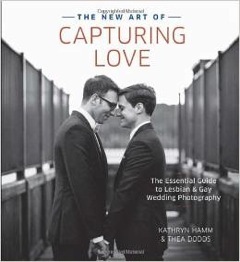 The New Art of Capturing Love shatters the “old standards” of wedding and engagement photography by showing how inappropriate they can be for today’s diverse couples, then shares easy-to-implement poses and techniques that can be applied to any couple (and wedding party), no matter their orientations, to create lasting memories. This entry was posted in LGBTQ Wedding Films on June 10, 2015 by videoadmin. This entry was posted in Venues we love to film on June 1, 2015 by videoadmin.